"Nahin tera nasheman qasr-e-sultani kay gumbad pe, Tu shaheen hai basera kar paharon hi chatanon per." Once upon a time, a Pakistani who also happened to be an Urdu literature lover, was travelling from one city to another somewhere in the northern areas of Pakistan. 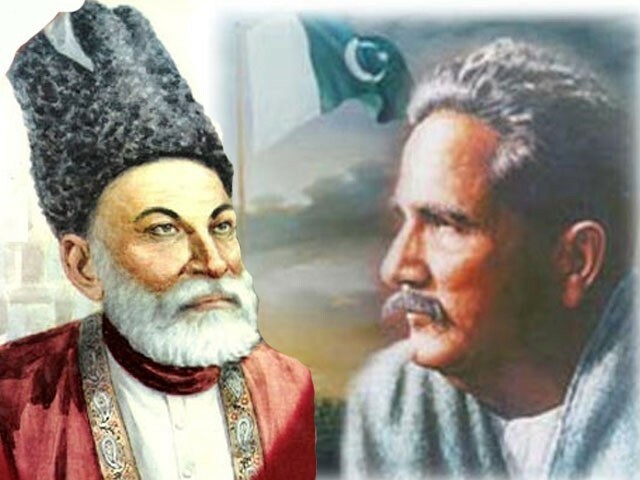 Throughout his journey, only two books were his companion – Deewan-e-Ghalib and Kalaam-e- Iqbal. During a long bus journey, his tired and weary yet over-imaginative mind was in a half-sleeping and half-dreaming state. In this trance, he found Ghalib and Iqbal sitting in the seats right next to him talking to each other, completely oblivious of his presence. The city was over-crowded and literally seemed to be bursting at the seams. But no one really seemed to care about the next person. People seemed to be too busy in their own ‘cocoons’ – in their self-created world. I was surprised to see their selfish ways and found them to be quite similar to our cities back in India as well. “That is so true. If you look at any city today – big or small – people seem to have become more and more materialistic, corrupt and selfish. Yet, in spite of being so self-absorbed, they seem even unhappier. They seem to have forgotten the very reason that this country was made for. I wish they could share the dream I had for this land. I was dismayed to see that instead of being concerned for this ailing country, the younger generation is busy with their own petty love stories, political feuding and worst of all, malicious practices and propaganda against each other in the name of religion. “Hahaha! I was pulled aside in a crowded market once and asked to lead the prayers since a group of people missed the congregation prayers in the mosque. My beard must have given them the impression that I was religious. But then they found another person right there with a beard that was an inch longer than mine and thankfully they let me go. I personally think that our youth is frustrated because of a lack of opportunities and corruption. Unfortunately, they are all too aware that there is no future for them even if they manage to get an education somehow. There are no employment opportunities without having influential contacts and sources. In such a situation, what else can be expected? “Hmmm, perhaps you are right Ghalib sahib. But I do not understand how and where we went wrong? We were on the right track when we started but then I do not know what happened. “Not just Pakistan Iqbal sahib, look at India as well. Things are not very different there either. Basically I think that all of us forgot everything and celebrated too soon. The euphoria of driving the British off our soil put us in that toxic state of a high where we forgot the very reason we drove them out in the first place. Perhaps, this sense of elation affected the whole nation like sweet, slow poison. And now we complain about corruption, poverty, unemployment and religious chaos. I find it so sad that every other educated person wants to migrate to the US, UK or Canada to earn a decent living, realise their potential and live a better life. Hum nay maana kay Dilli mein rahein, per khaweingay kya? “I did get a call from the authorities. My papers have been accepted and soon I will be off to Canada for good. They have decided to open a research university based on my philosophy and teachings. I guess that is the only way to keep myself sane and express my ideology without fear. I can no longer change my opinions just to please the ‘religious scholars’ here and I know that the west will listen to what I have to say with a more open mind. After all, how many times can I write Jawab-e-shikwa? “No plans really Iqbal sahib. All my friends like Meer, Momin, Haali, Sauda, even the young lads like Faiz and Faraz have left for greener pastures. I think I will also decide within the next few days. I have invitations from almost all the countries in the west. “Hmmm, I know what you mean. I will miss this land and some sincere people no matter what. But the situation over the last few decades has become such that I have not been able to sleep at nights for a long time. “Yes, I feel the same. I really do not know how I will live away from my beloved Dilli. But as you said, it is important to express what is in our hearts and minds. Sometimes I seriously feel that it was all a waste. Duboya mujh ko honay nay, na hota main tuo kia hota? And suddenly, the ‘true’ Pakistani – that poor Muslim (not a Sunni, Shia or any other sect – just a Muslim) Urdu literature lover snapped out of his weird dream and looked around the bus in embarrassment. However, all the passengers were busy looking at cricket scores and listening to cheap songs on their mobile phones. This ‘true’ Pakistani was last seen somewhere on the streets of America. A Strategy and Business Transformation Manager for one of the leading banks in the Middle-East. He lives and works in Dubai. A literature lover and a writer by hobby he mostly writes fiction inspired by true life events. Ghalib mai kamal tabdeeli laaiee hai sahib aap nay, k ab woh ummat e muslama k baaray mai he woh guftagoo karain gae aur uskae kirdaar k baaray mai fikarmandd houngae.